I looked at quite a few flower girl dresses before making the decision to sew it myself. I still had quite a bit of fabric and ribbon and a stash of appliques left from my mother’s wedding dress, and an amazing family friend [and excellent seamstress,] offered to finish the dress and figured out how to turn the overlay of my mother’s dress into the skirt of the flower girl dress [thank you, Norene!] I chose Butterick pattern 3351 for the simplicity of the design and appropriateness for a six year old. [Some of the flower girl dresses out there seem so over-the-top and way too grown-up…I really wanted something cute, youthful, and twirlable!] I absolutely love the final result, and it was practically free. 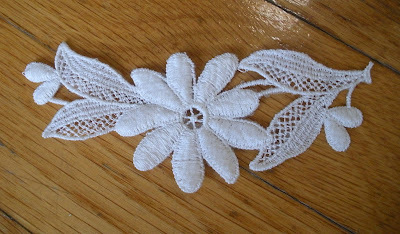 These appliques were scattered all over the skirt of my mom’s wedding dress. 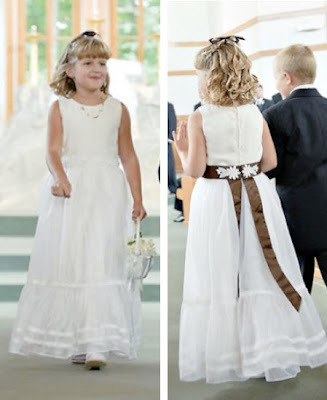 One was sewn onto each shoulder of the flower girl dress, and two were used along with a hook and eye closure to attach the chocolate brown sash at the back.